I don’t typically do follow-up posts on companies I’ve written about before, figuring that all you readers out there are more interested in fresh ideas. However, Awilco Drilling continues to present such a compelling value proposition that it richly deserves another look. I’m proud to say I was the first investing blogger to profile Awilco Drilling. That was back in May, when the stock traded around $14 and had not yet begun paying dividends. A lot has happened since. Dividends – True to its word, management has paid out substantially all free cash flow to shareholders – $1.00 per quarter thus far. Contract extensions – In May, the revenue backlog for WilHunter and WilPhoenix was $358 million. Now the revenue backlog is $800 million, with WilHunter fully-contracted until late 2015 and WilPhoenix fully-contracted until mid-2017. Improved liquidity and increasing market awareness – Until recently, Awilco’s trading volume was scant. Often fewer with 2,000 shares would change hands in the course of a trading day. Now, daily trading volume regularly exceeds 100,000, allowing many more investors the chance to accumulate a significant stake. This explosion in trading volume has been driven in part by some breathlessly optimistic Seekingalpha articles. Awilco Drilling released its third quarter results yesterday, and the numbers could hardly have been better. EBITDA rose 19.9% over the previous quarter and net income rose 24.5% on the strength of higher contract rates and controlled expenses. Revenue efficiency was an amazing (and likely not sustainable) 98.9%. What that means is Awilco’s rigs were able to earn revenue on something like 182 of the 184 rig-days in the third quarter. Notice the continued sequential improvement in Awilco’s results. For the four trailing quarters, Awilco’s EBITDA was $151.4 million and net earnings were $113.7 million. Total debt has fallen by 12% since the end of 2012. The company has $43.6 million in cash on hand. Despite a 50% run-up Awilco Drilling’s shares since May, the company still trades at remarkably low multiples of trailing results. All of these ratios are mouth-watering, particularly for a firm with low financial leverage and extremely high earnings visibility multiple years out. And yet, these ratios are misleading. Awilco’s earnings are set to rise dramatically in 2014. For one, Awilco’s rigs were employed at significantly lower dayrates for much of the trailing twelve months than now, and will soon bring in even more. Wilhunter entered 2013 earning a dayrate of $315,000. Wilhunter now earns $360,000 and will see its dayrate rise to $385,000 mid-way through 2014. 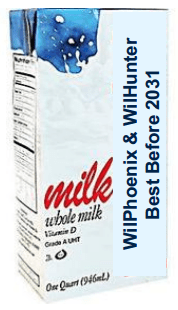 WilPhoenix entered 2013 earning $290,000. WilPhoenix earned a dayrate of $315,000 in the third quarter of 2013, and the rig’s daily revenue will soon rise significantly, hitting $387,500 in late 2014 and continuing for at least another three years. Awilco’s reduced debt load will also be a source of increased income as the company makes quarterly principal payments. The higher dayrates and shrinking debt load should be good for Awilco’s dividend, which the company announced will rise 10% to $1.10 for the next quarter. The company reiterated its intent to pay out all free cash flow as dividends, while maintaining a healthy cash buffer and funding capital expenditures. 2014 could see further dividend increases as the company’s earnings rise. For now, investors will have to console themselves with Awilco’s 20.1% yield. Awilco also outlined capital expenditure plans for the scheduled 2016 SPS (scheduled periodic surveys). Awilco will use the required inspection and repair period to upgrade each rig’s blowout preventer, or BOP. Awilco notes that BOP failure is the number one downtime risk for semi-submersible drillships, and that being fitted with brand new premium BOP systems will ensure that WilHunter and WilPhoenix can be hired by the supermajor operators. Critics of Awilco’s investment potential often bring up the risk of rig failure or blowout (suffering, I believe, from recency bias) so the news of upgraded BOP systems on the way should allay some of that concern. Awilco’s detractors also claim the company’s rigs have only a limited lifespan remaining, but the company reiterated its rig life projections: 18 years for each rig. Some company staffer created this graphic for the quarterly report, which I find oddly hilarious. Finally, the company used its quarterly presentation to express confidence in the North Sea rig market for 2014 and beyond, citing barriers to entry, sustained decommissioning and well abandonment work, and friendly UK government policy. The market is slowly waking up to Awilco’s potential, but it’s a slow process. For now, investors still have a chance to buy into a high quality operation at a startlingly low valuation. – 2013 operating costs have been exceptionally low. – The management is guiding 95 k / day cost level in 2014. A divergent viewpoint is always appreciated! I do expect operating expenses to rise, but I think management is being conservative. And even if operating expenses rise by $20,000 per day per day, the dayrate for each rig is due to rise much more. If operating expense rises $20,000/day but the dayrate rises $60,000/day (and that is conservative) then that’s just under $1 per share in increased pre-tax income. That alone should be enough to cover the increased capex. I also would not be surprised to see the company secure a line of credit. The debt load is becoming low to the point of being inefficient, at less than half of EBITDA. Taking on some additional debt while continuing to pay down the rig notes could reduce the cost of capital. Many Wilhelmsen companies make prudent use of debt. There is also the possibility they pick up another rig one of these days if its cash flow accretive. That is true. Management has repeatedly said any acquisition would have to surpass a high return hurdle rate and I hope they stick to that. Rather than pick up a new rig, I wonder if they would consider a substantial buyback program. It seems like it would make a heck of a lot of sense. Not sure what the liquidity situation is on the native exchange though. Perhaps a tender offer. A buyback would be very accretive to existing holders, but unfortunately the liquidity (market or balance sheet) is not there. 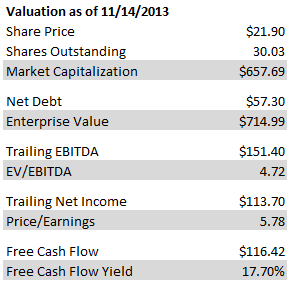 Only about 15% of the company’s share are free floating. The parent company owns nearly half, and various investment funds, pension funds and banks own another roughly 35%. Given the company’s stated commitment to paying out free cash flow in dividends, I see all free cash flow as committed in the short run. I’m long this as well, but I think a fair valuation has to note that a portion of the dividend/free cash flow yield represents a return of capital, not a return on capital, because the rigs are wasting assets that aren’t being replaced (like depletion of oil well). That being said, the probabilities of a rig blowout implied by the current yield seem quite high, though it’s hard to tell how much of the yield is due to concerns about dayrates 4+ years out. You have a point, to a degree. Awilco is fundamentally a wasting asset with an expiration date. Fortunately, because that date is far off, the valuation of the company does not change much when considering terminal value. For example, let’s assume the company pays the current annualized dividend for the next 18 years, then is worth nothing. No more cash flows. (Of course that’s a highly simplified case, but it’s only for illustration’s sake.) At the current share price of around $22, that’s an IRR of 19.15%. Now let’s assume an alternate case of a company like Awilco, but with an indefinite life. This company has a share price of $22, pays the same dividend as Awilco, but pays it forever. This company produces an IRR of 20.00%. That seems crazy that company that pays dividends indefinitely produces only a slightly higher IRR, but the present value of dividends decades out is so low that they barely affect the current share price. Awilco’s depleting assets will matter much more in a decade or so as the end of life for the rigs draws closer. Imo you are worrying about exactly the only thing that barely matters. The probability of a major accident is minuscule, but lower day rates, lower oil prices or a lower useful life are all very real possibilities in a couple of years. Another real risk, though quite difficult to assess, is poor capital allocation, such as buying another rig at exactly the wrong time. The fact that management is currently paying a dividend, rather than accumulating assets is comforting on this point. But this risk also increases over time as the rigs’ expiration date approaches. I am trying to calculate the minimum net income in 2014, by assuming that Premier only completes the minimum amount of days (140 days) in the current extension of the WilPhoenix. Assuming a 95% efficiency rate, revenue could be $44 Mill less than the maximum possible revenue (if Premier continues to contract the WilPhoenix until 10/31/2014). My only question is, how much will operating expenses and G & A expenses fall, if Premier only completes the minimum amount of days (140 days) in the current extension. Does anyone have any input? Someone would lease the rig if the option isn’t picked up, assuming nothing truly bizarre happens between now and then (e.g., oil prices collapsing to the point that it isn’t economical to operate the rig, in which case you have financially more-significant contract disputes to worry about). Why are you bothering to calculate this? I am trying to create a model for the probability weighted earnings for 2014. I believe that you are incorrect in your assumption that if Premier only contracts the WilPhoenix for 140 days, that Awilco will be able to find another company to lease the rig for the 85 days until the next contract starts. That is too small a timeframe. Granted there is a chance that the company taking over 10/31/2014 may want to start earlier, but there is no way of knowing that either. I am sure Mr. Waters will have some insight on this. Why do you think 85 days is too short a time frame? Awilco operates the rig, all a lessee has to do is decide if Awilco is going to extract oil worth more than the lessee’s total costs to lease the rig. Moreover, if Premier doesn’t pick up the option, I’m guessing they would make an offer to lease the rig at something lease than the option price. I don’t think the asset isn’t going to go unused unless something happens which has greater consequences than just Awilco’s not receiving 85 days of lease payments on a single rig. I also wanted to give a shout out to Dave for teaching all of us so much. Thanks! Multiply $137.7M by the percent utilization you think is reasonable and you have a revenue projection in case where Premier opts for the smallest period of the option. “Breathlessly optimistic” might even be an understatement. Still hard to believe that article caused such a pop in the price. Hi, Investors will always find some easy ways for higher dividends. There are many alternatives also available. Is there a record somewhere that I can see the history of dividend payout of a company? It would be great something like stock price in a chart form. Enjoy greatly the postings. Can anyone comment on the abandonment work and how that fits in. It is my understanding that there is a mountain of it out there. Also, the wasting asset is interesting. But I propose that the company is making payments on the rigs right now. Why can’t it acquire a replacement rig at the right time at a good price? I just don’t see this as an oil depletion proposition. The main counter to this is…can the company buy another rig with payments in line with what is being spent now. I doubt it. It seems to me they got a good deal on the rigs from RIG. So replacement rigs may cost more down the line. But these guys have a very good track record. There’s lots of CEO’s I would bet against…not so sure it would be these guys. Do you think Awilco is in oversold territory? This has been quite a drop in the last few days…. Any ideas on the cause? On other message boards, people have mentioned a new UK tax, a storm in the North Sea, and just general downward pressure on driller valuations recently. Afraid I don’t have any special insight. I view this as a great buying opportunity. I’d be happy to pick up shares at these levels. I think the sell-off is a gift. Awilco had a nice day today, thanx again for the tip Dave! Do you have any input or insights on the dramatic recent price decline of AWLCF? Do you think Awilco is a good buy at these levels? The recent sell off is the result of the two biggest shareholders selling 2m shares in one block at 120NOK when the price was around 140NOK. They got an offer and decided to sell. Understandable as they still made more than 4x their investment and selling 2m shares in the open market would have taken a lot of trading days and would have pushed the price down as well. They still hold 53% of the shares and Wilhelmsen have stated to stay a long term shareholder. I think the subsequent sell off is a result of many small private investors invested for the dividend here and simply panicked. Combine that with everybody saying the offshore drilling market is/will go in a cyclical downturn and Hess have (still) not executed their option on their Wilhunter option and you have some sort of ‘massive run for the exit’ situation in a thinly traded stock. hence the severe decline. Given the high current backlog, the fact that new BOB’s will be installed, the integrity of the management and the characteristics of the Northsea market makes this an absolute buy for me. Do you think there is a lot of risk associated with Scottish Independence? Are you buying shares at these prices? Did you already sell your shares that you purchased last year? I would like to buy some shares in AWDR but my broker H&L doesn’t offer it. Which broker could I approach? I’ve had success in purchasing the American ADR, AWLCF, through TD Ameritrade and Fidelity. I’ve bought the stock directly through Interactive Brokers. Be sure to do your own due diligence.